Stats are your friend. The stat that has seemed to come into play for me almost every day this week is the normal IB range. Statistically the normal IB range for ES is 6-8 points. The extreme for an IB range would be 10-12 points. To clarify the IB stands for Initial Balance, which is obtained from the 1st hour high to the 1st hour low of the cash session. Ok great, now how do you use this information to your advantage? Regardless of what technique or system you use, you should have pre-defined levels of interest for the day’s trading session. Once the trading range starts to approach one of your levels, it is either a good time to close an existing trade that has been going in your direction and/or look for a counter-trend rotation. Another analogy that I’ve heard applied to the IB range is that the width of the IB range is similar to a lamp base. The narrower the range, the farther it will tip over when it breaks. The wider the range, the more stable it is. With a wide IB of 8-10 points, one would look for signs of responsive buying in close proximity to the IB Low. I’ll use today May 20th, 2011 as an example. Today, the first hour high was established at 40.50. 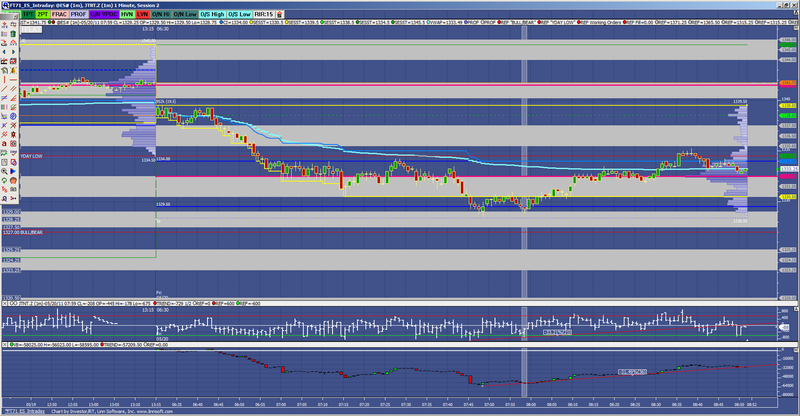 We had some negative news and ES started driving towards our first support zone for the day. The zone ranged from 32.50-30.50 which would put us at an 8-10pt IB range. I saw some positive tick divergence at 32.25 so I went long there. We got a 2 pt rotation from there which allowed me to scale out of most of my position. Given the internals and context at the time, I expected the IB Low to be tested and broken. Given the wide IB range I expected responsive buyers to be active below the IB Low. 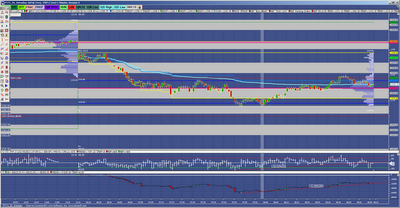 So I looked to my next support zone which was 29-27.50. Again I saw some positive divergence on the first test of the zone and even more divergence on the second test. Responsive buyers were clearly active below the wide IB. Conversely on days that we have a narrow IB range, say in the 5-6 point range, you will typically see further extension and I wouldn’t look for counter-trend trades until typically 1.5x - 2x IB range has been achieved. -Average IB range is 6-8 pts with 10-12 pts being the extreme in the current environment. -Wide IB: responsive buyers below the IB and responsive sellers above the IB. -Narrow IB: expect range extension once broken. Yes delta and NYSE tick are the two main things I look at. I usually just need one, but it's nice when both line up. I love this analysis - it is very helpful. Can we have more of these type of analysis please. It's all about delta and NYSE tick tick. But it's good or bad vice versa. But if both will line then it's good. Really good inforamtion. Please update some more analysis.